Police attempt to separate the two legislators in a fist fight. Courtesy Photo. 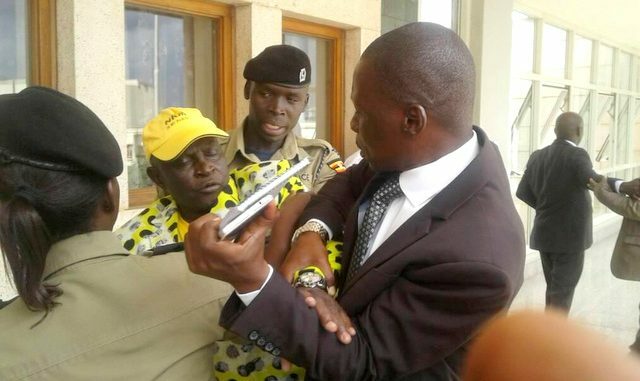 There was a fist fight at parliament Tuesday afternoon between Ibrahim Abiriga, the Arua municipality member of parliament and his Ayivu counterpart, Bernard Atiku. It all started after Abiriga reportedly insulted Atiku as stupid for having called him a Congolese national. According to Abiriga, Atiku called him a Congolese national during one of the Onduparaka FC football matches. “He told the players not to listen to me that I am not a Ugandan but a Congolese. 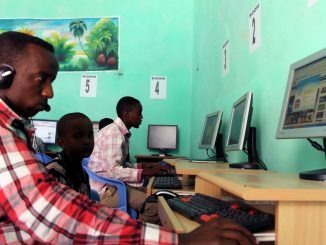 He is stupid,” Abiriga said. On hearing the conversation in the South Wing of parliament between Abiriga and some people, Atiku turned to David Abala, the Ngora county MP, saying the Arua MP was talking about him. Abala reportedly joked that Abiriga was a rebel prompting him to pursue Atiku. Eye witnesses say Atiku charged at Abiriga and punched him forcing him to fight back. 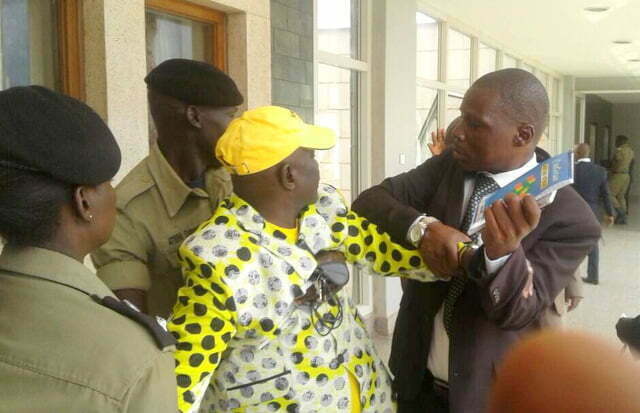 Fist fight at parliament between Ibrahim Abiriga (in yellow), the Arua municipality member of parliament and Ayivu MP Bernard Atiku (R). Courtesy Photo. It took the intervention of parliamentary police to separate the two legislators. According to information obtained by this publion, the two legislators have been bickering for some time. It is alleged that the bad blood between the two dates back to the time when Abiriga was still Arua Resident District Commissioner where he failed to recognize Atiku as West Nile parliamentary group chairperson. 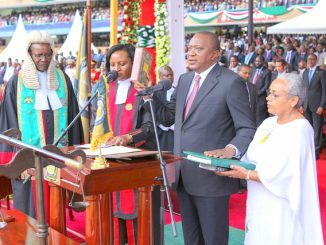 The fight comes at a time when tension is mounting of the proposed removal of the presidential age limits from the constitution. 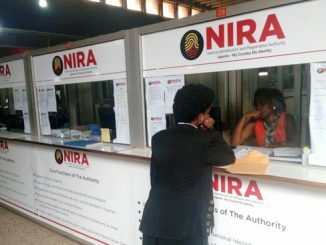 Abiriga is one of the legislators at the forefront of pushing the proposal, which has drawn angry reactions from a section of legislators including those in the ruling National Resistance Movement (NRM) party.